Elective sterilization (spays and neuters). Wound, laceration, and abscess repair. A typical surgery day begins the night before surgery! Healthy pets should be fasted for 12 hours prior to anesthesia – this usually means pets can eat dinner, but should not eat after dinner or in the morning on the day of surgery. Please keep water available at all times. Very young pets (less than 3 months of age), very small pets (less than 3 pounds), or pets with certain diseases (such as diabetes) may have special fasting instructions – please call to discuss these prior to surgical preparation. On the morning of surgery, cats and dogs are admitted to the hospital by the surgical assistants. Our staff will review the planned procedure and have you sign your anesthesia/surgical consent form and surgical estimate. Please read these forms carefully and feel free to ask questions! Pets are given an intramuscular injection of a sedative before anesthesia is administered. A sedative helps your pet relax so that less anesthetic drugs are required. Surgical drugs are individually tailored to your pet’s species, age, and overall health status. After sedation, your pet will have some hair shaved from one of his/her legs and an intravenous (IV) catheter will be placed. An IV catheter allows us to administer drugs and fluids directly into a vein. Pets undergoing general anesthesia are given IV fluids to support their blood pressure during surgery. Once a catheter is placed, we give an IV injection to induce anesthesia, place an endotracheal tube (breathing tube) into your pet’s airway, then use isoflurane gas to maintain anesthesia. Your pet is placed on a circulating warm-water blanket during surgery to help maintain normal body temperature. We monitor multiple parameters during surgery, including heart and respiratory rates, blood pressure, and oxygenation. Once your pet is under anesthesia, the surgical area is clipped and disinfected. The surgeon then drapes the patient and begins the procedure. Once your pet’s surgery is completed, they recover in a warm area with careful monitoring. 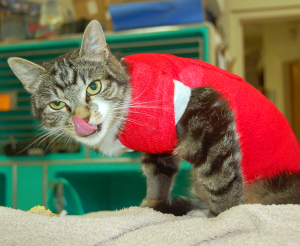 We monitor your pet for a few hours after surgery to ensure they continue to recover well. Pets typically go home in the afternoon or early evening. At discharge, our surgical staff reviews your written discharge instructions as well as medications (such as pain medication) that are needed after surgery. A doctor is always available to speak with you if you have additional questions. Our receptionist will schedule any rechecks or follow-up care (such as suture removal). We know it can be nerve-wracking to have a pet undergo general anesthesia and surgery. Rest assured that we take every precaution to make the procedure as safe as possible for your pet. We are always available to answer any questions that you have! 1. Pets that have been sedated or had general anesthesia for any reason typically need at least 24 hours of restricted activity. Pets that have stitches or staples, casts, or splints will require longer periods of restricted activity. Please do not let your pet run, jump, swim, or wrestle until cleared to do so. Pets may need extra toys or attention to keep them stimulated until their activity levels return to normal. 2. Surgical sites or wounds may have mild bruising, redness, redness and/or drainage for 1 to 2 days after surgery. These signs should get progressively better, not worse after surgery. Surgical sites, wounds, bandages, and casts should not have a foul odor. Drainage should be cleaned as needed with warm water and mild soap (such as Ivory soap) or wiped with a non-alcoholic hypoallergenic baby wipe. 3. Please keep the surgical site clean and dry. If it becomes dirty, please gently rinse with saline solution or gently spot-shampoo with warm water and mild soap. Gently dry the site after cleaning. Please call if excessive swelling, oozing, redness, heat, discharge, or bad odor occurs. Do not let your pet lick, scratch, or chew at his or her surgical site – this can irritate the area, loosen or pull out stitches or staples, and can cause infection. We typically provide patients with a protective collar (such as an E-collar or inflatable/donut collar) to prevent licking and chewing. Pets can eat, drink, and sleep while wearing a protective collar. If using a bitter apple spray or other lick-deterrent, please do not spray directly onto the surgical site. Stitches and staples are usually removed 10 to 14 days after surgery. Please note that we sometimes use buried absorbable stitches that dissolve over time and do not need to be removed. Your specific discharge instructions will indicate if/when your pet needs to return for stitch or staple removal. 4. Please give pain medication as instructed. If you are not sure if your pet is in pain, we recommend giving a dose of medication and monitoring for improvement. Please note that signs of pain can be very obvious (such as crying or limping), but can also be very subtle (such as avoiding eye contact or shallow breathing). Please see our pain management section for more information regarding signs of pain [LINK]. Please note is it easier (and more humane) to avoid or prevent pain, rather than manage existing pain. Please call if your pet seems uncomfortable after surgery. Do not increase medication dosing/frequency or give over-the-counter medications unless specifically instructed. 5. Please follow instructions for other post-operative medications (such as antibiotics or Pepcid) as instructed, even if your pet seems to be feeling better. Ending a course of antibiotics early may allow an infection to occur and delay surgical healing. 6. Pets will typically be quiet or tired the day after surgery. They may not want to eat or defecate the day after surgery. 7. Bandages, casts, and splints must stay clean and dry. There should never be a foul odor associated with a bandage, cast, or splint. Bandages that cover the feet, casts, and splints should be covered in a plastic bootie when dogs are walked outside; this bootie should be removed once a pet is inside. The skin above or below a bandage, cast, or splint should not look red, irritated, or swollen. YOU are an important part of our pet’s healing process. Please don’t hesitate to call if you have any concerns about your pet’s recovery!